John Naka's Sketchbook, a compilation of John's sketches from around the world, is available online from Stone Lantern. During demonstrations and workshops, John (the bonsai master) would transform bonsai material. But this was just one step in a development process that might take years – and John (the teacher) wanted to enlighten his student on how the final design should look. As it was easier for him to express his ideas with a pen than with words, John (the artist) would sketch his vision of the refined bonsai, and the lucky owner would be left with a beautiful sketch for guidance and inspiration. In 2000, Jack Billet and Dorie Froning proposed collecting these sketches into a book which would offer insight to John's artistic process. The range of bonsai styles and artistic approaches is diverse, and John's sensibility regarding balance and proportion is evident on every page. Each sketch was drawn for just one person – but now we can all appreciate their artistic and educational value. John was very excited about the publication of his sketches. Although he didn't live to see the book, he did get to see the sketch of him drawing that appears on the book's cover. This publication honors his dedication and talent; its sale benefits the John Naka Endowment Fund. What mattered most to John was the sharing of knowledge. This tribute to John will be an inspirational addition to your bonsai library. 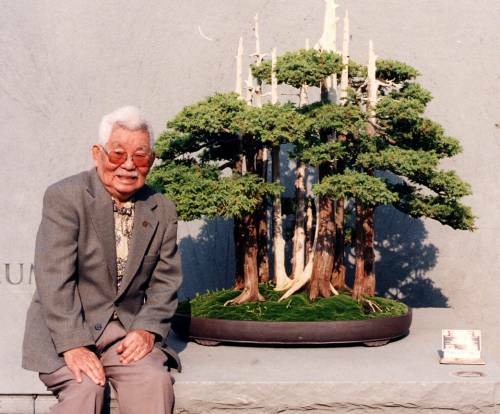 After John Naka's passing on May 19, 2004, the National Bonsai Foundation received numerous monetary contributions in his memory. In response to this worldwide outpouring of support, the John Naka Endowment Fund was established. Alice Naka, John's widow, was touched by all the contributions. It was her wish that the endowment fund be used for bonsai education and upkeep of the John Y. Naka North American Pavilion at the U.S. National Arboretum in Washington, D.C.